What’s in a cloumage? From the Shy Brothers Website: The Shy Brothers’ farm encompasses the highest land in a peninsula between the two branches of the Westport River. The farm gets cooling breezes in the summer, even fog some days. The salt air moderates temperatures in the winter months. The cows are able to stay at pasture longer than most in the region. The brothers are careful with their animals and of course don’t use any antibiotics or hormones on their milkers. The brothers control the quality of their herd, one of the secrets to great artisanal cheese! These unique cheeses start in the pasture and can’t be duplicated because of the unique characteristics of their soil, grasses, and microclimate. The cheese is made using the oldest technique: letting the milk and culture do the work. No heat, no pressing, no hurrying. The flavor develops over 4 days. 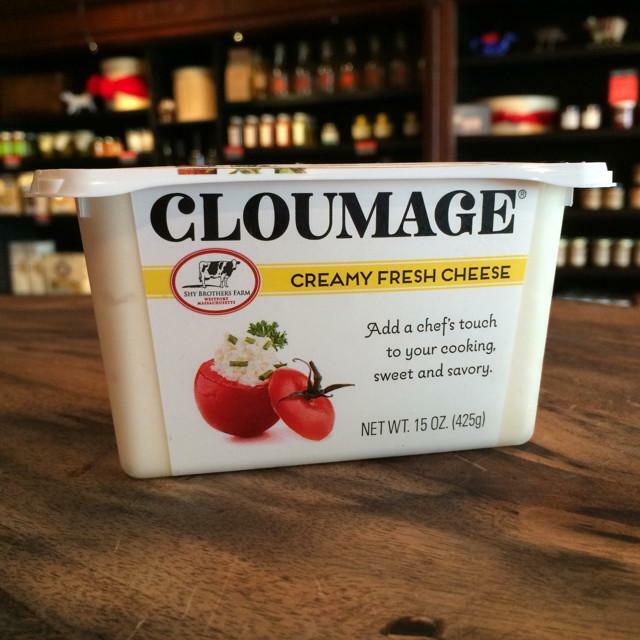 Cloumage® is a fresh lactic curd made from the cows’ milk at Shy Brothers Farm. When cooked, Cloumage® has the texture of a baked ricotta. Salad-potatoes-salmon-tarts-all flavors are enhanced by the zip of this curd. The lactic tang of the curd marries well with both sweet and savory flavors. We love it simply with fresh cracked pepper or fruit. 1. Preheat oven to 350 degrees F. Grease a 10in bundt pan with vegetables oil. Mix sugar and cinnamon together well, then stir in walnuts to evenly distribute. Set aside. 2. In the bowl of a mixer on medium speed combine Cloumage, sugar, and butter. Then add vanilla and eggs. In a separate bowl, combine the baking soda, baking powder, salt, and flour. 3. Gradually add the flour mixture to the Cloumage mixture to make the cake batter. Stir gently just to combine. 4. Place 1/3 of the cake batter in the Bundt pan. Layer with 1/2 of the nut mixture. Then repeat until you have three layers of batter and two of crumb mixture. Bake for an hour or until a toothpick inserted comes out clean. 5. Cool on a wire rack for 20 minutes before inverting. This entry was posted in Farm Stories, Recipes and tagged cheese share, cloumage, heather atwood, katie's cloumage coffee cake, shy brothers artisinal cheese by Jennifer Moore. Bookmark the permalink.